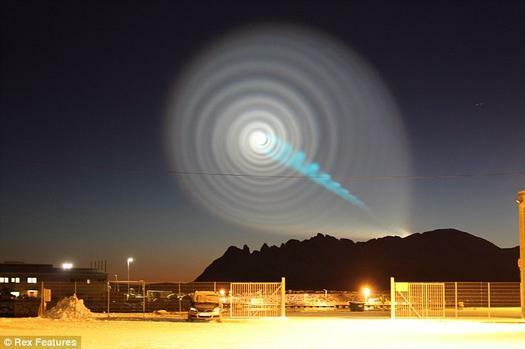 A bizarre spiraling light show over Norway has raised speculations ranging from a Russian rocket test to an odd meteoric display. The Norwegian Meteorological Institute remains unsure of the phenomenon’s origins, but astronomers have said that it does not appear connected to the Aurora Borealis, also known as the Northern Lights. “Now the pages in the National Encyclopaedia regarding inland ice can be torn out and burned,” Östlund told the newspaper. “I had been expecting old dates. But when I saw that the first numbers were very high I felt immediately that this was bingo. When the second number was five figures – I felt faint,” Östlund explained to news agency TT. Archaeologists were also then given new types of remains to look for – and several finds were then later uncovered. The biggest things in the universe just got bigger – or rather, they’ve always been bigger and we somehow missed it up to now. Supercomputer simulations of galactic core black holes indicate that instead of being a mere two billion times the mass of the sun, so insignificant you’d surely lose them if you sneezed, some could be as large as six billion suns -not including the “dark halo” that surrounds the Milky Way, which is more than ten times as much mass as all of the visible stars, gas, and dust in the rest of the galaxy. The study by scientists at the Max Planck Institute for Extraterrestrial Studies (which couldn’t sound smarter if it was Lex Luthor’s university degree) focused on Messier 87, a particularly bright active galaxy in the Virgo cluster whose size, strong signals and proximity to Earth make it a common astronomical experimentation subject. Dr Karl Gebhart and colleagues ran a supercomputer simulation to calculate the mass of the monster at M87’s core. You need to simulate a black hole’s size because there’s no way to observe its mass directly – you can only infer its immensity by studying the effects on the mass around it (little things like entire galaxies). Where the new model differs from past efforts is its inclusion of the “dark halo”, an unobservable ring of dark matter which astrophysicists now believe surround galaxies. Including something you can’t see might sound like a great way to get any answer you like, but the simulation worked it out by observing the effects of this halo on the visible stars, then accounting for those calculated effects when simulating the black hole – which is why the program took several days to run on a computer that could probably calculate you to ten decimal places in one minute. The dark matter halo is the single largest part of the Milky Way, covering the space between 100,000 light-years to 300,000 light-years from the galactic center. It is now believed that about 95% of the Galaxy is composed of dark matter, which does not seem to interact with the rest of the Galaxy’s matter and energy in any way except through gravity. The dark matter halo is more than ten times as much mass as all of the visible stars, gas, and dust in the rest of the galaxy. While the luminous matter we see in the night skymakes up approximately 90,000,000,000 solar masses, he dark matter halo is believed to include around 600,000,000,000 to 3,000,000,000,000 solar masses of dark matter. Don’t worry, the results aren’t entirely dependent on the dark matter magic-factor which affects so much of current cosmology – the results seem to explain observations which previously puzzled many scientists (always a good sign for a new result). Recordings of distant quasars show evidence of black holes far larger than anything we’ve ever seen closer to home. Now it seems that they were here all along, we just weren’t looking at them right. Dr Emily Baldwin, deputy editor of the UK’s Astronomy Now magazine, said: “Many scientists argued that what looked like fossils in the meteorite were really caused by the explosive event, such as an asteroid impact, that blasted the rock out of Mars in the first place. At first glance, the piece of metal in Steve Myers’s hands could be taken for a harmonica or a pen. Only on closer inspection can you make out its true nature. Myers, director of accelerators at the Cern particle physics laboratory outside Geneva, is clutching a section of copper piping from which a flat electrical cable is protruding. The LHC had been inaugurated at 9.30am on 10 September 2008 to a barrage of global media attention. This was the God Machine that would unravel the secrets of the universe, it was claimed. Beams of protons, one of the key constituents of the atom’s nucleus, were successfully fired round the machine’s subterranean 18-mile circular tunnel under the Jura mountains outside Geneva. Over the following weeks, it was predicted, scientists would recreate conditions that existed a trillionth of a second after the universe’s birth and start making sensational discoveries as they smashed beams of protons into each other. Discoveries would include the God Particle, a tiny entity also called the Higgs Boson, which is believed to give objects – including people – their mass. In addition, dark matter, a mysterious, invisible form of matter that permeates the universe, would be uncovered, along with a host of other revolutionary discoveries. “It was all looking so good,” said Myers. Then, at 11.45am on 19 September, things went spectacularly wrong. Faulty soldering in a small section of cable carrying power to the machine’s huge magnets caused sparks to arc across its wiring and send temperatures soaring inside a sector of the LHC tunnel. A hole was punched in the protective pipe that surrounds the cable and released helium, cooled to minus 271C, into a section of the collider tunnel. Pressure valves failed to vent the gas and a shock wave ran though the tunnel. Firemen sent into the blackened, stricken collider found that dozens of the massive magnets that control its proton beams had been battered out of position. Soot and metal powder, vaporised by the explosion, coated much of the delicate machinery. “It took us a long time to find out just how serious the accident was,” said Myers. A 400-metre chunk of the £2.5bn device had been wrecked, it was discovered. Worse, when scientists traced the cause to a tiny piece of soldering, they realised that they would have to redesign major parts of the collider’s entire safety systems to prevent a repeat event. That has taken more than a year to achieve. Now Cern scientists have begun firing protons round one small section of the collider as they prepare for its re-opening. Over the next few weeks, more and more bunches of protons will be put into the machine until, by Christmas, beams will be in full flight and can be collided. When fully operational, the LHC will soak up 10 times more power than any other particle accelerator on Earth, consuming 120 megawatts of electricity – enough for an entire Swiss canton – to accelerate bunches of protons, kept in two beams, each less than a hair’s breadth in diameter, to speeds that will come “within a gnat’s whisker of the speed of light”, according to Myers. One beam will circulate clockwise, the other anti-clockwise. Then, at four points along the collider’s tunnel, the beams will cross. Bunches of protons – each containing 100bn particles – will slam into other oncoming bunches, triggering collisions that will fling barrages of sub-atomic detritus in all directions. These explosive interactions will form the core of the great collider’s operations and will generate new types of particle, including the Higgs, that will pop fleetingly into existence before disintegrating into a trail of other sub-atomic entities. New physics will be uncovered with Nobel prizes following in their wake. And that is not all, say sceptics. They argue that miniature black holes will be created and one of these could eventually grow to swallow up the Earth. The LHC would then not only be the world’s biggest experiment – but its last. This fear has led protesters to make legal attempts to close down the LHC, one even making it to the European Court of Human Rights. All have failed, though one case – in Germany – has still to be resolved. Even stranger is the claim by another group of physicists who say the production of Higgs bosons may be so abhorrent to nature that their creation would ripple backwards through time to stop the collider before it could make one, like a time traveller trying to halt his own birth. “All Higgs machines shall have bad luck,” said Dr Holger Bech Neilson of the Niels Bohr Institute in Copenhagen. Thus the cable meltdown that afflicted the LHC was an inevitable effect of the laws of time, a notion that leaves most Cern scientists scratching their heads in bafflement. In fact, the real problem facing the LHC is simple. It is a vast device the size of London’s Circle Line but is engineered to a billionth of a metre accuracy. Ensuring that no flaws arise at scales and dimensions like these pushes engineering to its absolute limits. Cern almost succeeded last year. Now it is convinced that it has got it right this time. “All I can say is that the LHC is a much safer, much better understood machine than it was a year ago,” said Myers. Le futur sabote-t-il la recherche sur le boson de Higgs ?